The fun thing about a Potato Head toy was that you could make it be anything you wanted. You had a choice of different eyes, noses, mouths, and ears. You could give it a hat, or not. Ditto for facial hair. Or any other kind of hair. Want to wear a different pair of shoes? You can swap those out in a jiff! It was the best kind of toy – totally ridiculous, yet creative and fun at the same time. Potato Heads aren’t just fun for kids – even as an adult I’ve found that switching around the various parts for a few minutes helps me relax and feel playful again. This costume can help bring that feeling full circle this Halloween! Of course, after a while the various pieces started getting lost when you were a kid and then you didn't have as many options. 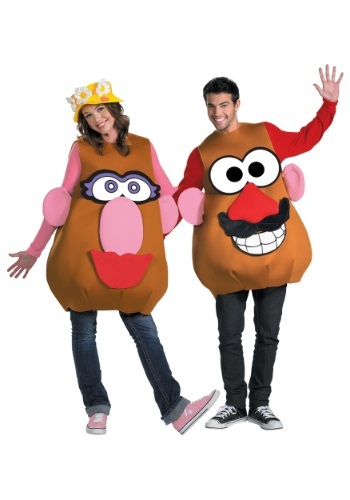 Maybe you ended up with an extra hat as your new pair of shoes or an extra mouth where the eyes should be, but no matter - you can have all of those options again with this Mr / Mrs Potato Head Plus Size Costume! The costume base is a sleeveless, foam-backed tunic that fasts at the back with a Velcro closure. The ears are sewn on (sorry if you wanted to swap the ears out for an extra set of arms! ), but the other parts of the costume and face are interchangeable. The face pieces come for both male and female potato heads and they attach to the tunic with Velcro. Grab a pair of these costumes for a fun couples costume this Halloween!